Samuel Johnson and John Ash give the most succinct and minimally-correct definitions. In the above, notice the general, historical understanding that the nature of punch derived from the combination of specific ingredients: sour, sweet, strong and weak. The fifth element in punches might be spices, citrus zest, or even first brewing tea in the water to be used. The fifth element seems to have become optional in punches by 1700. None of the above sources make the bowl central to the definition of drink. In fact, they don’t even mention it! To define punch by the bowl is a modern gloss on the word. David Wondrich has suggested, against all historical sources, that the origin of the word was not from the Hindi word for ‘five,’ but rather from the English word ‘paunch.’ Wondrich seems to suggest that it was a reference to the fat shape of punch bowls. This is sheer, revisionist guesswork on the part of Wondrich – seemingly as a result of the typical modern assumption that service in a bowl was a unique part of the identity of punch at its beginning. When punch first enters history around 1600, other types of drinks had been made and served in large bowls for centuries already – even milennia. In fact, it was the default service for any drink for multiple persons – and since that’s the way people mostly drank, the bowl was the default service vessel for most tipples. The notion that around 1600, anyone would think the bowl was a unique part of a specific type of drink betrays an inability to actually understand historical texts in their own terms – and, therefore history, itself. The modern gloss that punch is any large-batched alcoholic drink served in a bowl (or redefined in such silly words as, “large-format cocktails”) misses the fact that the Whiskey Sour, the Margarita, the Sidecar, and the majority of so-called ‘craft-cocktails’ pretty-much perfectly fit the historical consensus on what punch is. To those that ask where the water is in those drinks: think of the fluid-ounce, or more, that is added when they are shaken. One might wonder why it is that so many of the truly popular drinks are punches. The answer is that the balance of sour, sweet, strong and weak usually makes for a tipple that almost everyone can enjoy – even those people who rarely find enjoyment in unmixed liquor or true cocktails. David Wondrich has also stated that he cannot believe punch is originally from India – also against the historical sources. Wondrich is almost onto something here, but draws the wrong conclusion. To be sure, there is no hint of punch being made in India before the British arrived there. But, neither is there any evidence that punch was made anywhere else by the British before they started going to India. 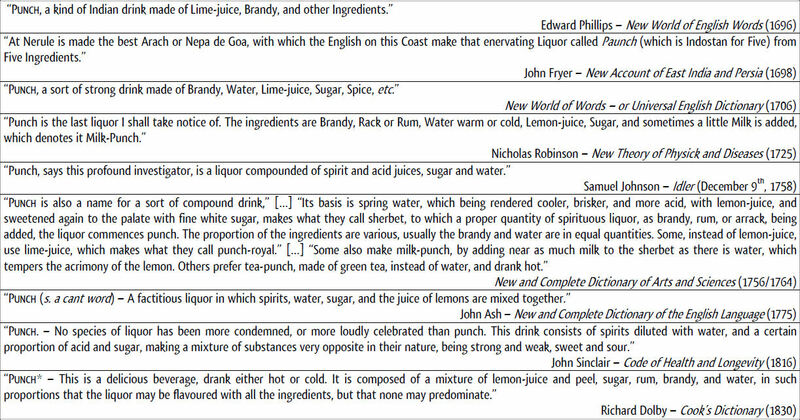 I suspect that punch was first made by Englishmen in India around the year 1600. I believe it was a result of the British proclivity (inherited from Greece and Rome) to flavor, dilute and sweeten alcoholic beverages — combined with the wealth of citrus they found to be constantly available in the Asian sub-continent. Next > Serendipitous Libbey #8475 Find! Sir, you weary me. “Sherbet” appears as “sherbert” precisely once in my book Punch, on page 295, which is in the Index, for which I was not responsible. On pages 29, 92, 95, 96, 136, 175, 177, 178 and 277 it appears as “sherbet” or “sherbett.” The rest of your misperceptions and gross oversimplifications of my arguments may be judged accordingly. As for your misspelling: my library is still packed up due to the relocation, so I must assume that my memory of the error was exaggerated. For that I am sorry. I have deleted that passage. It had no affect on the meat of the issue, though, which you decline to deal with. On your weariness: it is not my goal to weary you. A greater understanding of drinks by genres (at least among the professionals) that will foster a greater intimacy with the features of each, and how to make each type great in its own right, is. I think the century-long gloss of the word cocktail has hurt mixology – not only that of cocktails, but of all types. I will challenge what I find to be mistaken understanding of types of drinks everywhere. For about ten years now, I have seen you become regarded as the largely-solitary and uncontested expert on traditions in mixed drinks. That is never a healthy situation in any field of study. My arguments may weary you, but a better understanding of mixological tradition will surely result – regardless of who is correct on any specific point. I do feel that I understand the tradition in a very deep way, and will continue to make my points as clearly as possible, often mixed with a dose of iconoclasm. Of course, we could correspond and relate ideas to each other for review. But, I doubt that would suit your… ideas of what you do and who you are. So I will continue as I have. It works for me. Your feelings about the tradition are your feelings. A great many of them are mistaken, although I have no doubt that they result in tasty drinks (e.g., the Swan Cocktail in Old Waldorf Bar Days, of which you make so much, actually calls for “Juice of one lime,” while Straub’s version, with the portion of lime juice you deem correct, calls for “Dry Gin”; inconvenient, but incontrovertible). By forcing an unruly and heterodox tradition into narrow, theory-based categories, you do a disservice to the men and women who each interpreted this great tradition in their own way. I won’t address your arguments, based on the same memory you have displayed here, because unfortunately I am a busy man; if you finally unpack my book on Punch and read it more than cursorily you will find that you have mischaracterized it. My reputation does not rest on my own claims and my ideas of who I am are mostly concerned with not being the kind of person who misses a deadline by more than a couple of days. You may continue to chivy me, if it makes you feel better–indeed, I know that you shall. Yes, I have always been aware that Straub indicated dry gin. I have no problem with that. I just felt like the Waldorf’s use of genever was probably older — especially since the Waldorf recipe also contains gum syrup, which tends to fall out of drinks over time rather than being added to them – in the historical record. Besides being probably more original, I also felt it was better suited to the drink. I usually make note of such decisions on my part in my book — but many instances get past me. I do everything, including all proof-reading and editing and correcting of my book myself. As for the juice of one lime – the lime in question before prohibition (in all parts of the U.S.A. except perhaps California and the west coast) would have been a bartender’s lime – the Citrus aurantiifolia, vulgarly known as the Key lime (though few are still from there). If you juice that little guy, you will find that it actually yields just about the right amount to accent a true cocktail. They yield anything from a few drops of juice to about a quarter-fluid-ounce – but, usually less. It’s difficult not to project modern assumptions backwards, even with limes. What’s funny is that I forgot that I had already updated the post to deal Straub’s version of the drink last week! But let me ad, as a capstone, I’d be happy to discuss any of this stuff in person over a drink, in Portland, whenever I make it there, in New York, whenever you make it here, or wherever. Who knows, we might actually agree on something. I am sure that we would agree on far more than we disagree on. It’s the points of disagreement that rub. I have read both of your books, more than once each in sum total. If there were more items of disagreement, you know that I would have already engaged them. Well, David, I am easy to reach. But, if you gave me some way to reach you other than via critique, it could happen.